Jeff Hankin began studying drums at age 8, and had his first union-scale performance booking and his first private drum student at age 12. In nearly six decades as a musician, he has performed with many jazz, rock, blues, symphonic, chamber, and musical theater groups, in venues ranging from small clubs to large concert halls. He has taught drums and music at elementary to college level, at public, private, and commercial music schools. 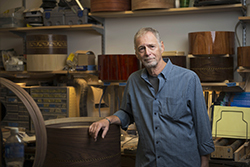 In 2008, Jeff founded Carolina Drumworks, dedicating the company to crafting fine instruments that he would want to own and play himself. That ethic has provided the guidelines for establishing the rigorous design parameters and quality standards that the Carolina Drumworks brand has become known for. Jeff quickly realized that hearing a talented artist playing an instrument that he had built gave him as much, if not more, satisfaction than performing itself did. Additionally, he discovered that drum-making allowed him to combine his real-world experience with drums, design, woodworking, photography, marketing, and business operations into a single focus. Jeff earned his college degree with a major in music at University of Chicago, and was a Graduate Teaching Fellow at Brandeis University. He also studied at the San Francisco Conservatory, the Louisville School of Music, and the Cincinnati College-Conservatory. His percussion teachers have included the principal timpanists of the National Symphony, Louisville Symphony, Cincinnati Symphony, Metropolitan Opera, and New York Philharmonic. He has attended drumset clinics with Louis Bellson, Dennis Chambers, Dave Weckl, Chester Thompson, Larry Londin, Horacio Hernandez, Ginger Baker, Virgil Donati, Jeff "Tain" Watts, and others, and a master class with Joe Morello. As a composer, Jeff learned from students of Paul Hindemith and Nadia Boulanger, as well as from a Wyndham Hill recording artist and a composer-in-residence at Catholic University. Having resided in Washington DC, Louisville, San Francisco, Chicago, Boston, and Baltimore, Jeff now lives and works in the mountains of western North Carolina.